During the last 15 years, I've tried out tons of products (quick-dry underwear, SPF shirts, microfiber towels, ear plugs, water bottle filters, pickpocket-proof clothing) that would make traveling easier, more practical, fun, and enjoyable. Some of my favorite products are below and each has made a huge difference in the quality of my trips. I also began carrying travel insurance, which I didn't think was necessary when first starting out but I now find just as important as anything I pack. It's proven invaluable, covering everything from lost luggage and illness to emergency travel changes. I even wrote a blog post about Why You Need Travel Insurance. There are lots of travel insurance companies but I've had a great experience with World Nomad's and highly recommend them. If interested in purchasing the products, please consider using the links below, which will earn me a few pennies, without costing you extra money! Packing cubes to stay organized and find stuff easily! 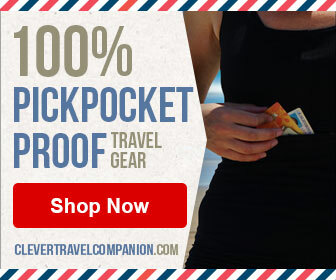 Pickpocket-proof clothing to keep my money and passport safe! Leave large containers at home and bring refillable, travel-size containers that take up less space and don't need to be checked on airplanes. Ziploc freezer bags are a great budget option to waterproof your electronics and make excellent see-through storage containers for toiletries. I've turned into one of those travelers who wears "travel clothes" just about every day, everywhere. They are so practical! The pants and shirts below are super light-weight, rain-resistant, and offer SPF-protection so they're perfect for all weather. I even wear them on hot, sunny days since you stay cooler in light-weight, long sleeves than when your skin is exposed to direct sunlight. I also always bring one nice dress for dinner and dancing. I am a very sensitive sleeper so I NEED this comfortable, space-saving sleeping pad and inflatable pillow. A water-proof sack is invaluable to protect belongings while rafting or simply lounging on the beach. I always bring a light water bottle with a filter to countries that don't have potable drinking water. I've spent many months in Peru, Bolivia, Cuba, and Mexico without having to buy a single bottle of water, saving money and the environment! Electrolyte tabs are convenient (and much healthier than sports drinks) so I pack them on trips when I'll be doing a lot of hiking and biking. They're also great for countries where you may get "travel tummy" and need to replenish fluids. This water filter has gotten me through 7 months in Peru, Bolivia, Mexico, Malaysia, Cuba, and Thailand. Fill it with mountain, river, or questionable tap water, apply pressure for 15 seconds, and you're ready to go! Quick-drying underwear can be hand-washed in the sink (or river) and dry overnight. I always order black, which double as back-up swimwear. The Diva Cup will SAVE YOUR LIFE. Never worry about buying or packing pads or tampons again. It's an eco-friendly, money-saving, life-changing device that just about every female traveler I know swears by. Nothing ruins a vacation faster than lost, damaged or stolen luggage so I ALWAYS carry travel insurance that covers theft, missing baggage, emergency flight changes/cancellations, illness, collision damage, accidental death and all the things you don't want to think about when planning a trip. World Nomads is my favorite provider, I've used it (and had to file claims) many times, and I recommend it to all clients who travel with me on group tours.